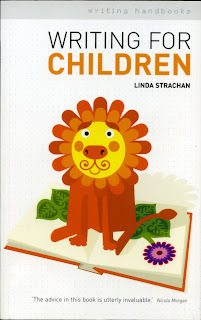 First of all, a big thank you to Linda Strachan. Reading her book, Writing for Children, helped me get started with writing for young folk, to persevere with my revisions and submissions and, eventually, to find a publisher for Coping with Chloe, my first children's/YA book. Writing for Children certainly opened a number of gates for me. First and foremost, it helped me believe I could do it. I'd already had two books published for adults, but writing for children was something new, and I had no illusions that it would be easy. Linda Strachan's book focuses on writing for children up to the age of 12, and she tells you everything a beginning author could possibly need to know, in the straightforward and unassuming manner of one who has been doing it for years and has over 50 books to her name. Unusually, she gives plenty of space to writing non-fiction as well as fiction, and she also discusses at length the practicalities of writing for a fee or writing for companies like Working Partners. All this was new to me and very useful to learn about. Strachan also discusses writing and publishing poetry and plays, and there's a useful section on research. She gives a great deal of helpful advice on the mechanics of writing - how to get ideas, how to tackle plot, structure, characterisation, dialogue, settings, beginnings and endings and point of view... and how to revise your work. Strachan provides useful writing exercises, too. Normally I skip the exercises in books, but I did try some of hers and I'm very glad I did, as they are unusual and inspiring. She takes you through the process of how to prepare your submissions and send them off to agents and publishers - and what to do when the inevitable rejections come. There's a useful chapter on what to expect of your publisher or agent - and what they might expect of you. Plus there are many ideas for self-promotion and advice on how to deal with school visits and other author events. Money matters, contracts and royalties are covered, too, and Strachan offers good counsel on how to work - as I do - without an agent. At the end there's an invaluable list of resources of all kinds, including organisations for writers, courses and consultancies, plus magazines, websites and recommended books. Another great thing about Writing for Children is the way it is scattered throughout with helpful and inspiring remarks by children's authors of all kinds (plus Anton Chekhov, for good measure). You get the feeling that you're in the company of experts and that, with their help, you won't go far wrong. I've started recommending this book to budding authors who come to me for advice about writing and submitting their children's books. My copy is now severely battered. Like a favourite old teddy bear, I still turn to it from time to time, and the section on handling rejection is well-stained with coffee, chocolate crumbs and tears. It's been scribbled on, too, and a number of the page corners turned down. Can a recommendation come more highly than that? It's a good recommendation especially when you say your own copy is so well-worn. I don't know why I haven't looked at Linda's book before. I will now. Thanks Rosalie.